Paul Conquest started Track Junkies in 2013, when his local drag strip owners graciously built them a road course. He immediately started working with MotorsportReg and we've seen his events grow bigger and better every year. Track Junkies is primarily a recreational lapping day group with 12-14 dates a year. They also provide instruction for novice drivers to make sure their events are safe, and last year they added timed lapping. Paul has also partnered with the track owners at Castrol Raceway in Alberta to run the track portion of corporate events. MotorsportReg: Tell us a little bit about yourself? Paul: Preparation is everything. For me, that means checklists and more checklists. I sit down the night before every event and go over my checklist to make sure I have done everything I need to, packed all the goodies I need in the trailer, charged the radios, filled the coolers with ice, etc.. If you take care of all the stuff you can foresee, the stuff you can’t foresee is much less stressful to deal with. Paul: I'm not sure if it is entirely unique, but we are continually making small incremental improvements that will improve our customers' experience. For example, we have a rather small paddock with faded parking lines, so at our early events it was nightmare. Literally, cars were triple-parked and others were blocked in their parking stall and late for their sessions. So we bought coloured traffic cones to match the driver wristbands and assigned parking areas by group. Everyone is moving in the same direction now, at the same time, and we no longer have people backing over someone else's spare tire or luggage in the parking lot. Sounds minor, but people come to me all the time and comment on how well organized we are. Paul: We’ve tried a number of avenues, including direct mail, car shows, website … all of which create a level of organic growth over time. But what has really provided us the best exposure and growth has been building a bridge to other motorsport communities through the track owners. Our local track also has a drag strip, dirt oval, and motocross track. We quickly found that a lot of people with an existing interest on one area of motorsport were interested in trying out other areas as well. For example, we decided to try running our events from 1-9 Fridays (instead of 9-4) so that we would be running opposite the Friday Night “Street Legal” drag events. Immediately we had people walking over to the road course and asking how to get involved. We also run events where drivers can experience the track behind a pace car for about one-third the cost of a regular track day. A local car dealer (also one of our instructors) has signed on to provide the official pace car, and a couple of our instructors have offered to drive. We send three cars at a time out behind the pace car for a warm-up lap, three laps “at speed” and a cool down lap (about 10 minutes in total). Speed is regulated by the slowest car in the group which typically means we are going quite slow by the standards of an experienced driver. If participants want to go out again, they can get back in line --- behind 30-40 other cars --- as many times as they want until the evening is over. And we shamelessly promote Track Junkies open lapping events, where they get to choose their own (likely much quicker) pace and get a LOT more track time. MSR: What's next for your club? Anything new and exciting for the future? Paul: I’m not sure how exciting this will sound, but we just bought a school bus. No, not to race. We really like the educational opportunity of a track walk, but if you actually walk the track it takes 90 minutes ... and we just don’t have that kind of time in our schedule. But a bus ride around the track takes only 15-20 minutes. So starting this year we are offering a 20 minute track orientation for novice drivers, in the hope it will get them up to speed quicker. It just takes one instructor to drive the bus and another to talk to the participating drivers, with a brief stop at each of the salient points (braking zones, turn-in points, apexes, track out, etc.). We’ve only used it once, but our instructors all commented on how much more quickly their students got up to speed … so I think it is already working. Paul: I just could not devote the time necessary to keep track of 60+ registrants at 12-15 events each season. Just thinking about the efficiencies of MSR, I would guess that it saves me 25-30 hours per event by collecting registrations while I work elsewhere (or sleep) and makes it possible for me to get ready for an event in just a few hours ... most of it a couple of nights in advance. Paul: I don't think I've even scratched the surface of what MSR is capable of. What I love is the incredible flexibility of the reporting functions, and the ability to save customized reports. I've set up reports that I can quickly view on screen to make sure everyone who paid for an instructor actually has one, see who's never run with us and needs a checkout ride, and print out all my stewards lists and check-in sheets within a couple of hours the night before an event. And I recently found the email blaster function within the reports that allows you to really drill down and customize your email distribution lists in a hurry. MSR: Thanks for your time Paul and good luck with your events. 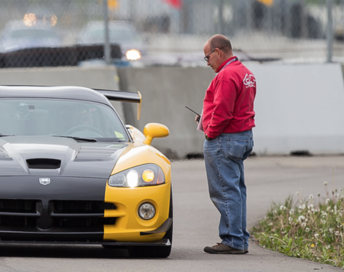 Track Junkies is Alberta's premier open-marque performance driving program. They offer owners and drivers of high-performance and sports cars the opportunity to drive their car on a race track at speed. They provide a safe and welcoming environment for participants to explore the capabilities and limits of their cars while improving their driving skills. You can register for one of their upcoming events here.